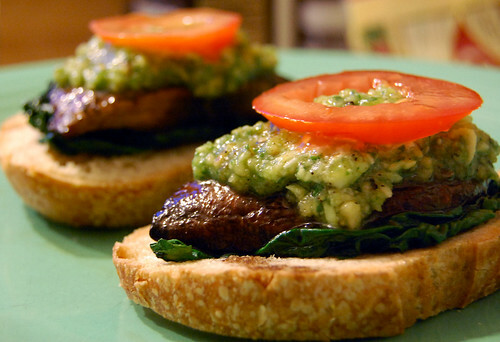 Portabella mushrooms are like steaks to vegetarians and vegans. Am I right? And I've been craving "steak" for a while. So, last night we set out to use some of our awesome aged balsamic vinegar from Fiore in Bar Harbor, ME (that we won as part of Erin's -- Domestic Adventure -- giveaway several weeks ago). At first, we simply planned to eat the 'shrooms plain. Maybe with a few side items. But then I got the idea to make pesto and create an open-faced sandwich. We had a ton of basil, but didn't have even one pine nut. Walnuts (you know, the ones we DIDN'T buy two bags of at the grocery store the other day?) to the rescue! 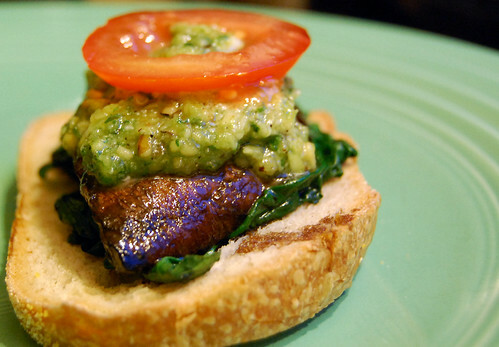 A couple toasted sourdough slices and a bunch of sauteed spinach later, and this sweet and savory sandwich was born. What you'll need for four mini-sandwiches (serves 2) . . . Prepare the mushrooms. Mix together the balsamic vinegar and olive oil in a large, shallow bowl. Coat the portabellas with the mixture -- let sit for half an hour. You may want to spoon more of the mixture over the bottom side of the portabellas for optimum saturation. If you like, make more mixture. But we found we had enough. Just depends on how big your mushrooms are. While you're soaking the mushrooms, prepare the "pesto" by putting all ingredients in a food processor and pulsing until incorporated. We left ours rather chunky. Then set aside. You may also prepare your sauteed spinach during this time. Just heat the olive oil in a large pan until warm, then add the spinach and cook over low to medium heat until wilted and coated. Set aside. Toast some sourdough bread (four slices to be exact) and set aside. Then start a large pan over medium heat on the stove. Place each mushroom -- bottom side down -- on the pan and cook for a few minutes. Then flip over and continue cooking. You may wish to spoon over some more of the mixture. Just keep the heat at medium. Continue cooking until the mushrooms are soft. Then slice each in half so you have four pieces. Put it all together by starting with one slice of sourdough bread. Then a quarter of your sauteed spinach. Then one of the mushroom pieces. Then a quarter of the pesto mixture. You may also top with fresh tomato or whatever else you like. Continue until you run out of ingredients. Have you entered our H2O Bottle Giveaway? If not -- you have until Monday, March 15th. It's just our way of celebrating reaching over 800 subscribers! Go check it out here.